Private Matt Duffy wakes up one morning in a hospital ward in Baghdad’s Green Zone with scrambled brains and scrambled memories. He’s awarded a Purple Heart before he can even remember exactly what he did to earn it. Matt just knows there was an alley he wasn’t supposed to be in, an Iraqi boy who wasn’t supposed to be there, and a rocket propelled grenade that was supposed to hit him—but didn’t, though it knocked him around pretty bad. Now Matt has to piece together the broken bits of his memory to try and establish what happened in the alley that day. But the higher ups don’t seem to be looking into his story too closely and Matt starts to wonder if they want to learn the truth—or bury it. Soon Matt rejoins his unit, happy to be back with his friends but troubled by the fact that he still doesn’t know exactly what went down the day his world exploded. What did he do? Did he run? Did he hide? Did he cover his buddies? Did he…kill someone? With a minimum of words and a maximum of heart, Patricia McCormick tells one young soldier’s story that could be every young soldier’s story. “It wasn’t about fighting the enemy. It wasn’t about politics or oil or even about terrorists. It was about your buddies; it was about fighting for the guy next to you. And knowing he was fighting for you.” Matt’s feelings and observations are sincere and very real, based on McCormick’s extensive research and interviews. With only a few words, she quietly captures small moments that bring the war right up out of the pages. Like when Matt sees orderlies coming down the hall pushing a gurney with a body bag. “Still, he kept his head erect, his back stiff, his mouth set in a straight line as the gurney got closer. Then, just as it passed by, he flinched.” When Matt finally does learn the truth about what happened that day, he begins to realize that the black and white war he believed he was fighting is much grayer than he could have ever imagined. This sobering psychological mystery pulls no punches. Want to learn more about what it’s like on the ground in Iraq? An excellent nonfiction follow-up is The Good Soldiers by David Finkel. If Sarah Dessen and Jenny Downham collaborated, it might look a little like this rad reinvention of the mean-girl novel. Full confession? I dreaded reading this book. C’mon, a teen relives the last day of her life over and over? (Have I ever mentioned that Groundhog Day is one of my most hated movies of all time?) And it’s loooonnngg. Like 450+ pages long. But surprise, surprise, Lauren Oliver had me at hello with this elegantly crafted and completely mesmerizing story about a dead girl who learns what it means to live in just seven short days. Unlike Groundhog Day, each February 12 of Sam’s day is different, a whole life lived in 24 short hours as she tries to accept what she has lost and wishing she appreciated it more. The length ended up being important, as Sam goes over every detail of the careless existence she took for granted, causing YOU to consider all the little things in your life that you never think about but would miss terribly if they all went away. Like sunsets, little sisters and sappy movies, just to name a very few. Despite the length, there was a feeling of constant suspense as I wondered how on earth Oliver was going to solve Sam’s existential conundrum. I ended up loving every bit of it: the premise, the way Sam’s character realistically develops over the course of the story, the bittersweet end and yes, even the voluminous page count. This is a heart book. You will have an illogical urge to hug it when you’re done. I found myself racing through it, and sighing with great satisfaction upon finishing the last page. As you will, when this lovely and amazing tome comes to a library or bookstore near you. The crackerjack team of Hale, Hale & Hale are back with another rootin’ tootin’ graphic adventure of that wild girl Rapunzel and her trouble-making friends. This volume covers the back-story of ‘Punzie’s scheming sidekick, Jack. Before he met Rapunzel out west, Jack made his living swindling chumps in the big city with his partner Prudence, a stylish pixie with a serious attitude and an addiction to fancy hats. He was forced to skip town after a problematic beanstalk, a golden-egg laying goose and an angry giant named Blunderboar made it unsafe to return home to his hand-wringing, bakery-owning mama. After hightailing it west and meeting Rapunzel, Jack knows it’s time to head back home and make things right. Except in his absence, the fearsome giant Blunderboar has set up a corrupt shadow government and taken Jack’s mother prisoner in order to force her to bake his human-bone meal bread. Now Jack and Rapunzel must team up with Prudence and verbose muckraking journalist Frederick Sparksmith III to uncover Blunderboar’s citywide scheme and prove to the people once and for all what a, well, BOAR Blunderboar really is! All the while, Jack is trying to work up the courage to tell Rapunzel how he really feels about her. But will silver-tongued Frederick sway her heart instead? This action-packed sequel is every bit as entertaining as its predecessor, and then some. Jack’s big city, in contrast to Rapunzel’s Wild West, is a bustling technological marvel, which adds a little steam punk to the whole whimsical affair. The imaginative team of Hale to the 3rd power envisions their fantastical teeming urbanity as a magnet for diverse immigrants of every color and creed; from Native and African Americans to fairies and porcine half-men. Thanks to Nathan Hale’s meticulous attention to detail, each full color panel is a little work of art. This GN was so much fun that just writing this review makes me want to read it again! Batten down the hatches and tie up the dirigibles–this is one wild ride. Incarceron is every criminal’s worst nightmare: a sentient, ever evolving prison that morphs and grows according to its dark needs. Prisoners are born, live, love, fight and die in its depths like fleas on an infinite dog. Like the Christian hell, it is endless and full of nothing but sadness and pain. Originally intended to be a utopian miracle of technological reform where criminals would be reborn and remade, the prison instead grew a cold intelligence and turned on it’s makers and the poor creatures trapped within it. Those on the Outside, in a parallel universe where humans have chosen to live like medieval villagers in an attempt to escape the anxiety of change and technology, still believe it is a paradise, while those who languish within do nothing but dream of escape. Only one man knows the truth about Incarceron—it’s warden John Arlex. He possesses one of two crystal keys that allows communication between his world and the galaxy of the prison. Despite his best efforts to keep it hidden, it falls into the hands of his clever daughter, Claudia, who quickly uncovers its powers. She discovers she can use it to speak to a scrappy, desperate inmate named Finn, who has found the other key and claims to have been born Outside. They soon find out that they share a secret that could undo the crushing bonds of both their worlds, but first they must engineer Finn’s impossible escape. But Incarceron loves its son Finn. It doesn’t want him to go. And did I mention that no one has ever escaped? Like, EVER? This astonishingly original sci-fi thriller is like a grimmer, grown-up version of The Giver—only with lots more blood, guts, and breathless escapes. Seamlessly melding philosophy, politics, culture and mythology, this super smart fantasy is like nothing I’ve ever read before, and it will have you in it’s iron grip from page 1. 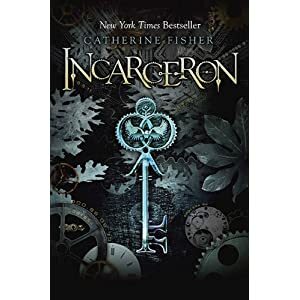 There’s tons of cool twists–just when you think you’ve got it figured out, the plot takes a 180–and I just WISH I could see your face when you find out just where Incarceron is, and how it was created. SO COOL! Count this fab fantasy one of my first major favs of 2010. Following in the fantasy footsteps of Harry Potter and The Wizards of Waverly Place, Gunnerkrigg Court is a funny, off-kilter graphic novel that chronicles the educational adventures of Antimony Carver, a precocious and rather dry seventh grader. Needless to say, the Court is NOT like other institutes of higher learning. Within days of joining the student body, fiery-haired Antimony befriends a Minotaur (“I prefer to be called Basil”), discovers one of her teachers is really a knight, and traps a deadly demon in her stuffed animal. She navigates the peculiar corridors of the Court with her best friend Kat, and together they deal with everything from old-fashioned ghosts and talking shadows to scarlet-eyed mean girls and lovelorn bird boys. When faced with an insurmountable problem, Antimony is never at loss for a solution, whether that involves quickly constructing a winged robot to run an important errand, or blowing up a death ray created by armless space aliens, even though “I can’t help but wonder how creatures without arms could make such a device and tie my friends up.” All the while, Antimony keeps trying to uncover the mysterious origins of her parents, who were former students of Gunnerkrigg Court. But as her mother has died and her father has disappeared, answers are in short supply. While volume one ends with even more questions, this collection of Thomas Siddell’s original webcomic still turns the tired old “magic school” premise on its ear with it’s bizarre manga-esque-looking characters and oddball humor. And I’m not the only one who was wooed by the weirdness: Neil Gaiman called Gunnerkrigg Court his “favorite webcomic” while ALA’s Great Graphic Novels for Teens committee named it to their 2010 Top Ten list.